Buck a beer: Where can you actually find $1 beer in Ontario? 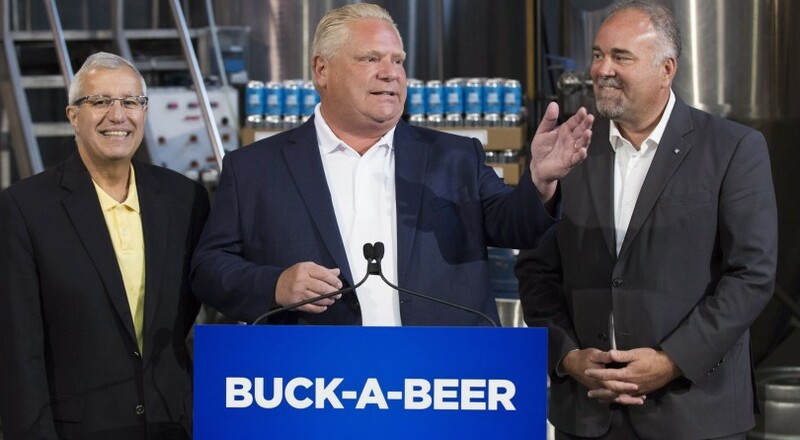 Ontario Premier Doug Ford announced a return to ‘buck-a-beer’ in the province this week. Ford campaigned on the idea of lowering beer prices with the catchy slogan. Come August 27, the minimum price floor for a bottle or can of beer will be lowered to $1. While that sounds insanely cheap, note that for the last 10 years, the minimum price for beer was only $1.25. Before 2008, ‘buck-a-beer’ did exist, until the Liberal government boosted the price of a 24-pack of beer from $24 to $25.60. It’s up to brewers to actually pass down the savings of $1 beer to consumers. The government is offering incentives like prime shelf real estate, free LCBO advertising and other perks to encourage brewers to lower their prices to $1 in time for Labour Day. Whether or not the incentives work, don’t expect draught beer from your favourite restaurant to offer $1 beer. The ‘buck-a-beer’ changes don’t apply to brews sold in restaurants and bars, nor will they affect the price of ciders, wines and other spirits. In the meantime, there are already plenty of beers that sell for cheap in Ontario. Carling lager sells for about $1.60 a can (or $38.95 for a 24-pack) at the Beer Store, Maclays and Laker for just $1.70 and $1.65 a can, respectively. Lakeport, the brewery that adopted and popularized ‘buck-a-beer’ in the past before being purchased by Labatt, also still sells for just $1.60 a can. Have you heard of an Ontario brewer that’s promising to sell $1 beer? Drop us a line at [email protected].